Fly control mineral, when fed at recommended rates, produces a dramatic reduction in fly populations and an overall improvement in livestock health. Flies can be more than a nuisance – they can literally kill profits. It is estimated that the beef cow industry in North America loses one billion dollars in profit each year due to flies. Kay Dee offers several minerals with fly control products. When fed at recommended rates, you'll see a dramatic reduction in fly populations and an overall improvement in animal health. Controlling horn flies will have a positive economic impact on your herd. Control Flies with Kay Dee Altosid® IGR Products! Altosid® IGR: an Insect Growth Regulator (IGR) that passes through the animal and into the manure, where horn flies lay their eggs. It breaks the horn fly life cycle by preventing pupae from developing into biting adult flies. The active ingredient in Altosid IGR is (S)-Methoprene, a copy of the horn fly’s own biochemicals. (S)-Methoprene even controls horn flies resistant to the organophosphates and pyrethroids commonly used in conventional horn fly control products. In more than 25 years of use, there have been no known cases of flies being resistant to (S)-Methoprene. 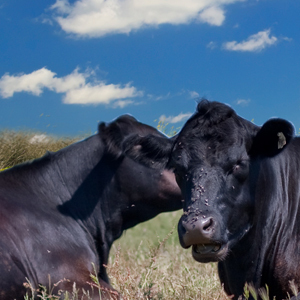 Altosid IGR is a convenient way to control horn flies in beef and dairy cattle. Rabon®: An oral feed through larvicide that kills fly larvae of all four fly species – horn flies, face flies, house flies, and stable flies. Rabon does not cause any insect resistance issues after prolonged feeding and remains active for up to six weeks. Rabon is EPA approved for beef cattle, lactating dairy cows, horses and swine. Rabon has no environmental issues and does not harm soil, water, plants, or beneficial insects such as dung beetles.